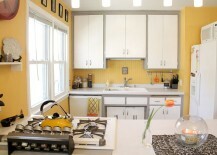 Thinking of giving your kitchen a refined and refreshing makeover as you head into summer and fall? 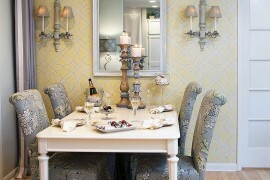 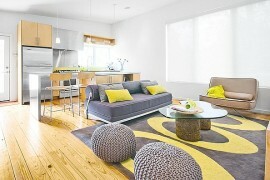 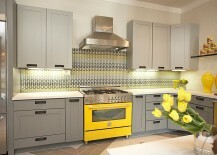 Few colors out there bring that perfect balance between sophistication and eye-catching elegance like gray and yellow. 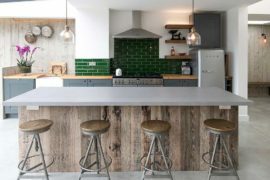 A combination that is quickly catching on across the globe largely because of the new-found love for gray in the last few years, it is still a novelty when it comes to the contemporary kitchen. 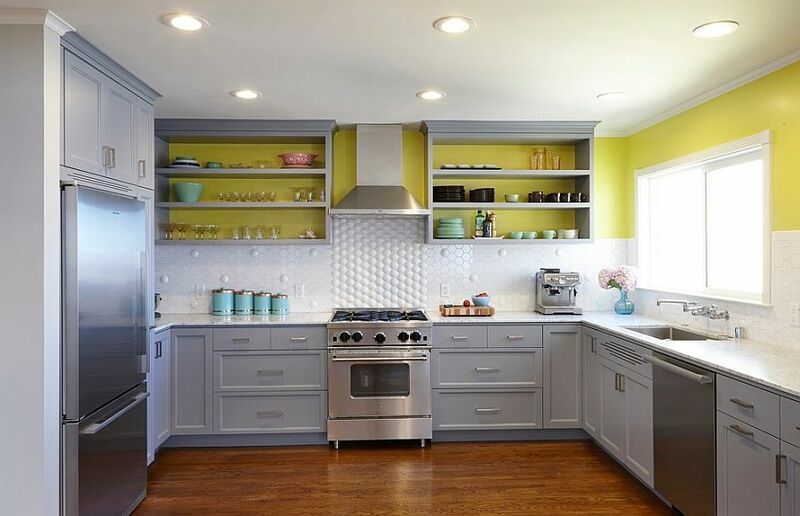 While gorgeous gray and yellow bedrooms and stylish living rooms with this classy color duo are far easier to find, kitchens still seem to be largely stuck in the ‘white along with bright color’ mode! 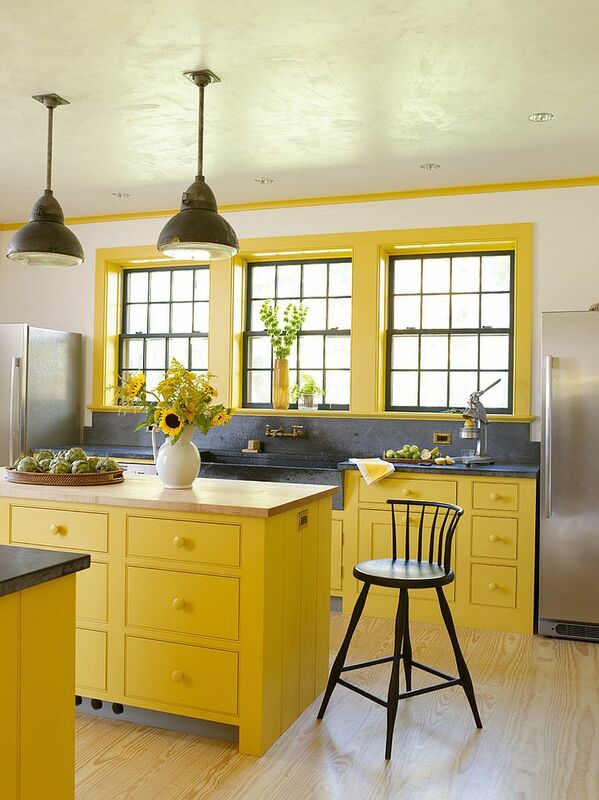 Yellow is one of those hues that seems to capture the joyful bliss of summer to perfection, and this is especially true if you add a light, mellow shade or even a cool pastel yellow backdrop to the kitchen. 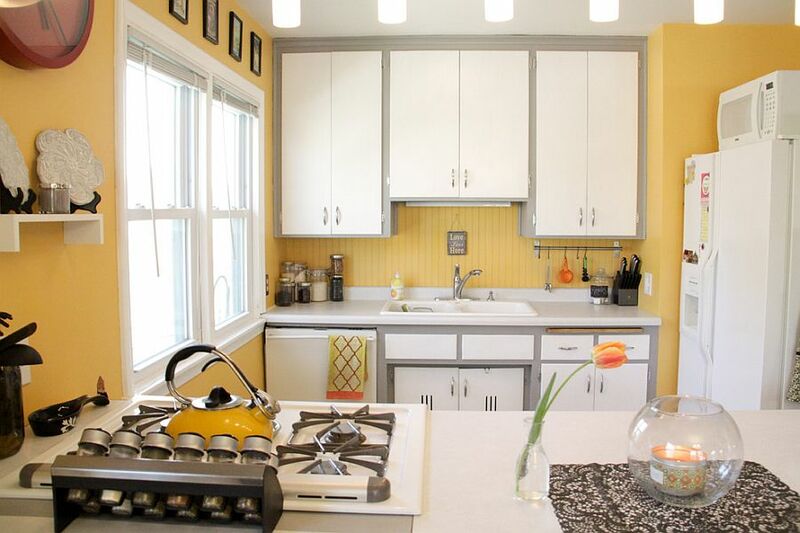 The farmhouse-style kitchen below combines this bright yellow magic with a dark gray backsplash and countertops to craft a captivating and relaxing kitchen. 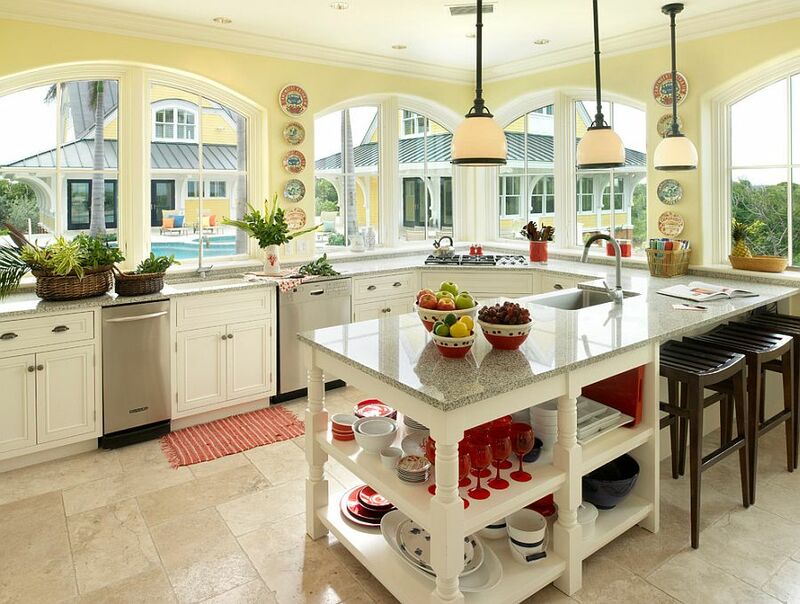 The flood of natural light helps add to the cheery ambiance. 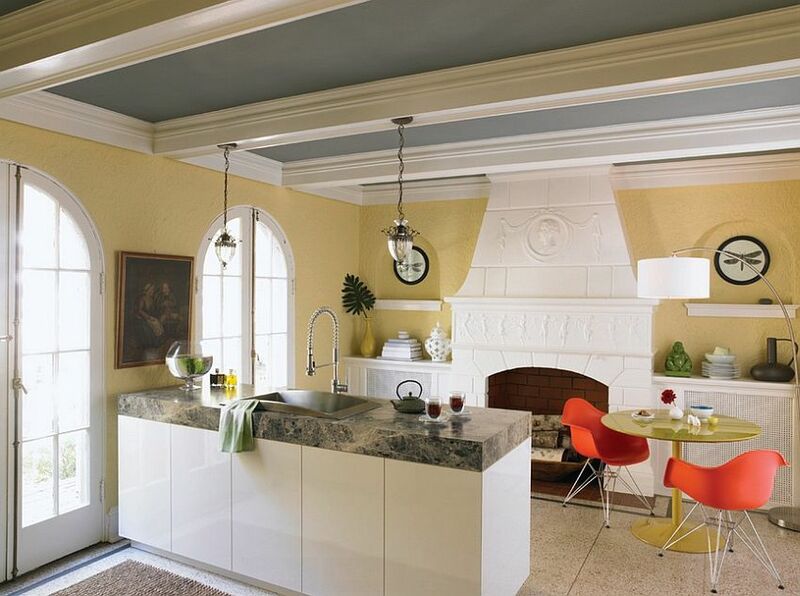 Here is another kitchen that takes the traditional notion of gray as the principal color in the room and yellow as the one used in moderation and flips it on its head. 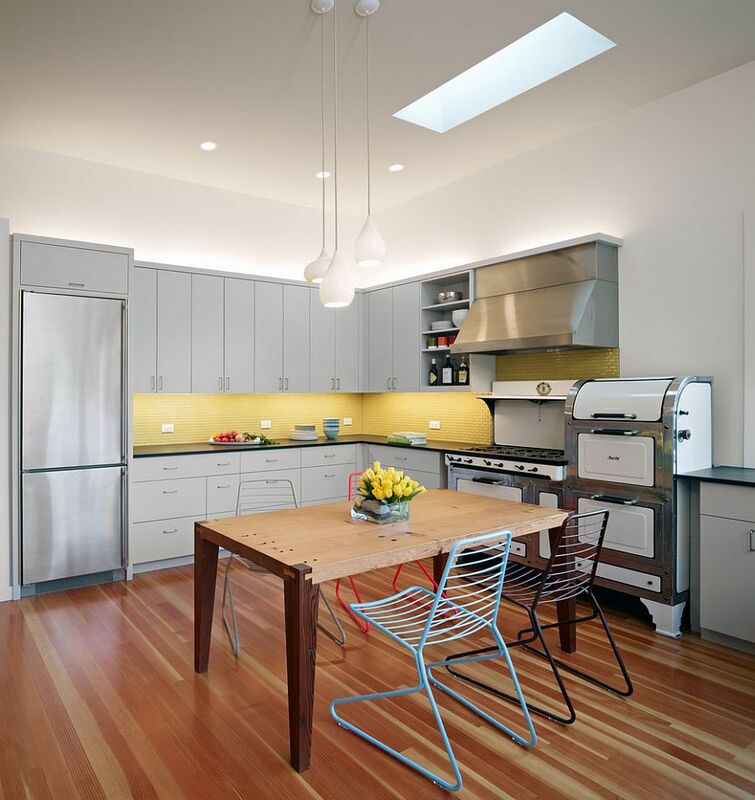 When it comes to the kitchen, there is absolutely no reason to hold back on yellow; even in case of cool, contemporary kitchens. 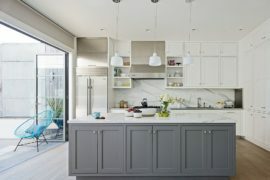 Gray here brings definition to the white cabinets and makes a big impact even though it is used in a very limited fashion. 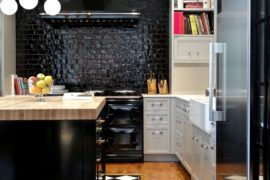 There are plenty of ways in which you can usher in a color of your choice and the next lovely kitchen reminds you that color is not the only option. 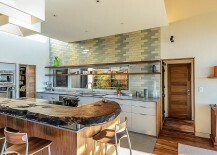 It is the exclusive kitchen worktops that bring in the gray while yellow sets the mood for an inviting, tropical hub that looks over the pool area outside. 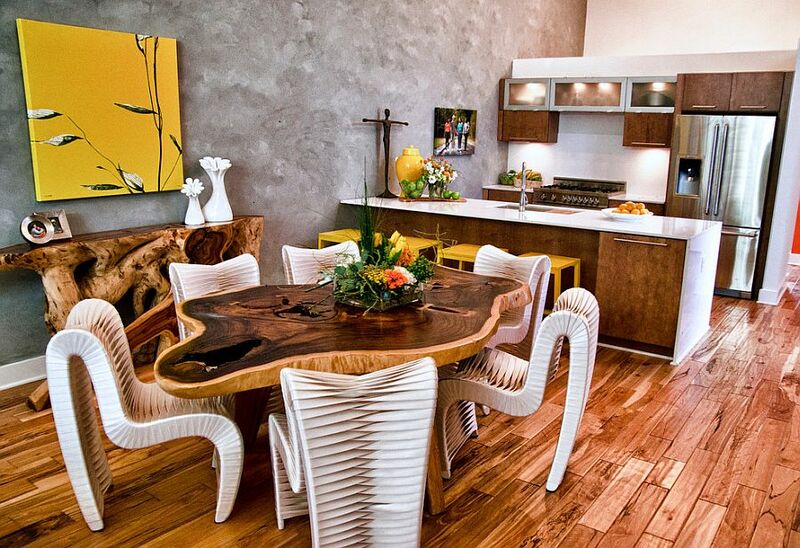 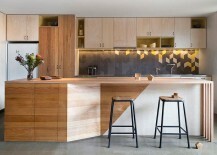 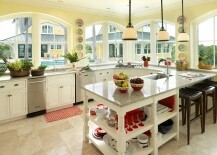 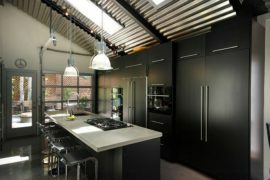 A perfect kitchen indeed for the warm summer months ahead! 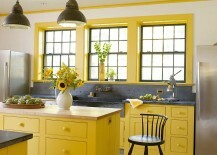 Now here is a kitchen that tells you that the yellow and gray kitchen is not just for spring, summer or fall. 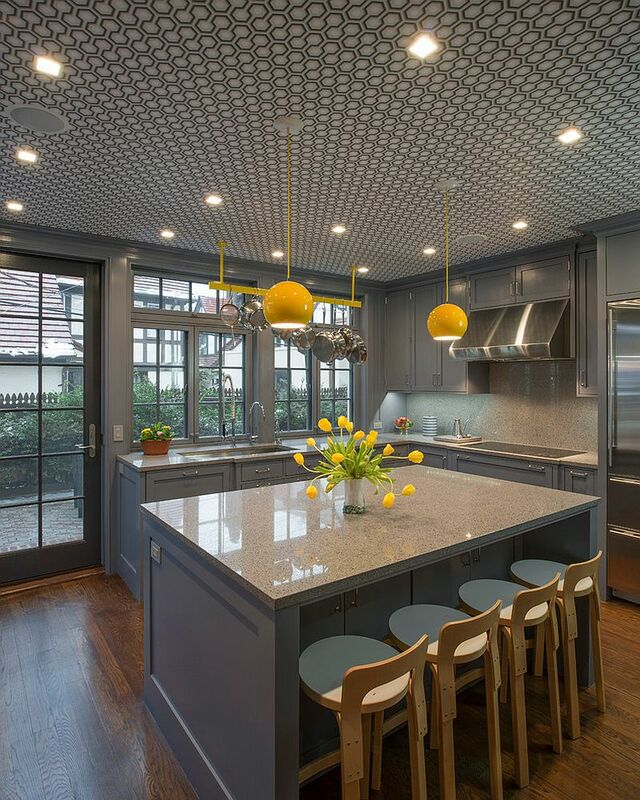 It is a style that works all year long when done right, and we absolutely adore how the all-gray backdrop (including the wallpapered ceiling) lets those yellow pendants shine through. 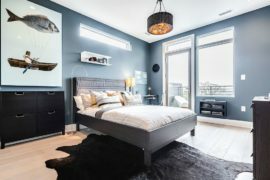 Another advantage of taking this approach is that you can essentially switch out those pendants (and the flowers) and add a completely different hue by bringing bright red, blue or even copper lighting fixtures! 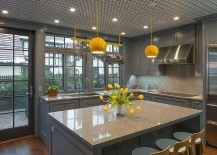 Adding a hint of gray and yellow to your existing kitchen can also be done without actually giving it a complete makeover. 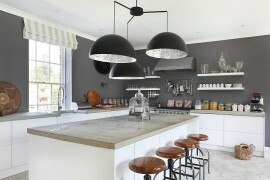 Instead of wrapping up the entire kitchen in these two hues alone, opt for a more reserved approach like the one here. 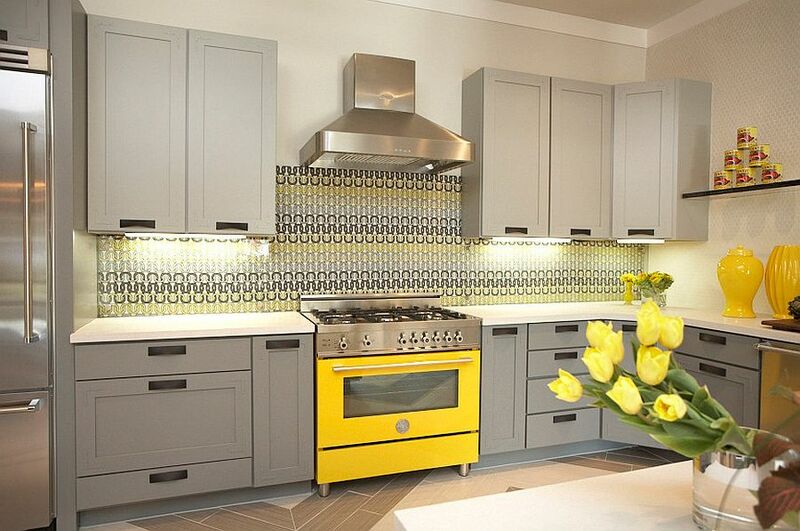 The subway tiles in gray and yellow add color to this contemporary kitchen while leaving the Midcentury style of the space undisturbed. Another great use of tiles to give the kitchen its dose of yellow and gray, this is an idea for those who are not too keen on too much yellow disturbing the existing color scheme of their home. 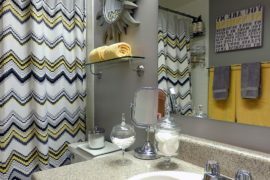 The dozen or so lemon yellow tiles combined with gray and white pieces still make plenty of visual impact and yet also seem to gently melt away into the backdrop. 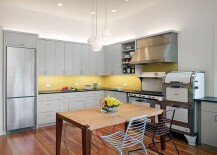 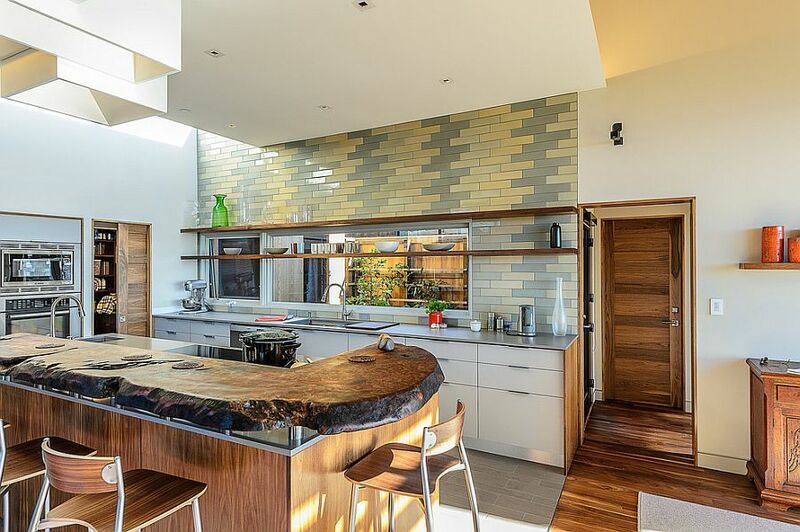 Notice here how the LED strip lighting literally puts the smart backsplash under the spotlight! 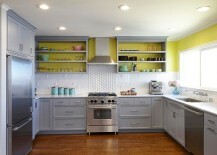 So, are you ready to try out the duo of gray and yellow in your kitchen?